The BKT Jumbo Trax HD Skid Steer Tire is a newly designed tire with premium tread depth for longer life on pave roads, tarmac and hard surfaces. 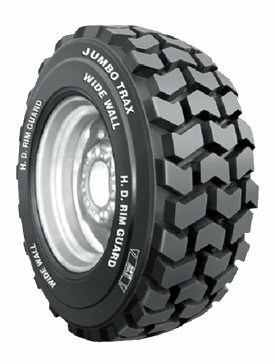 The BKT Jumbo Trax HD Skid Steer tire features excellent tread depth and larger more rugged tread blocks. The BKT Jumbo Trax HD Skid Steer tire was designed with a special tread compound for excellent chip and tear resistance and exta thick sidewalls protect against damage.